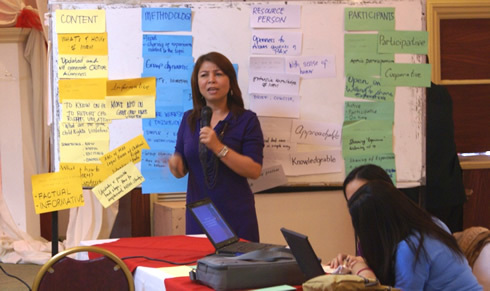 WMSU-Center for Peace and Development Director, Dr. Marcelina Carpizo (standing) discusses intently the workshop’s goals. Western Mindanao State University-Center for Peace and Development (CPD), in partnership with Katilingban Para saLalambuan Inc. started off with the Two-Day Orientation on the Monitoring and Reporting Mechanism (MRM) on child rights violations last September 14 at Marcian Garden Hotel of this City. Spearheaded by CPD Director- Dr. Marcelina G. Carpizo, the UNICEF-sponsored event aims to create a core group to prevent occurrences and trigger immediate response to child rights violations, especially in armed conflict areas.The MRM was formally created by United Nations (UN) Security Council Working Group on Children Affected by Armed Conflict (SCWG CAAC) thru its Resolution No. 1612 in 2005. Topics covered by the orientation were mainly on Child Rights and Child Protection; awareness on Children Affected by Armed Conflict; and the processes of MRM and its instruments in ensuring protection of children in said situations. Invited participants to the event belong mostly to the non-government organizations (NGOs), faith-based organizations and the academe. Participants of the event came from Davao, Cagayan de Oro, Sulu, Tawi-Tawi, Ipil, Pagadian, Basilan and from this city. Furthermore, these would-be partners were trained on how to utilize the structured mechanism in their respective localities. In that way, sustainability and responsive linkages would be in effect.